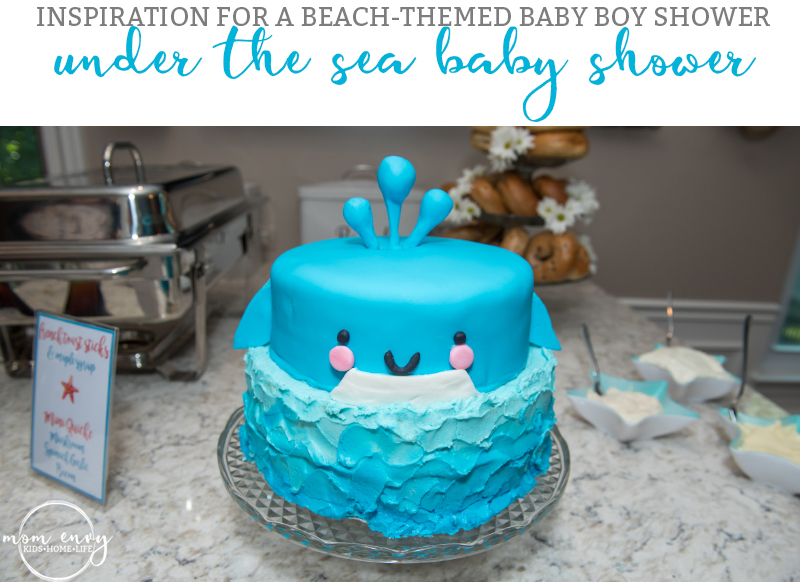 Just recently, My Mom, older sister and I threw my twin sister an Under the Sea baby shower. She has been so blessed lately and she moved into her dream area near the beach. Since she’s moved to beach town, she has decided to decorate her house in a beach theme. We thought it was only fitting to throw her a beachy baby shower. Today, I wanted to share with you the details for some inspiration for the shower. Isn’t she gorgeous?? She is all belly. I can’t wait to meet my first nephew! I have two beautiful nieces so it will be fun to have a little boy in the family that isn’t one of my own. Carl was so excited when we found out she was having a boy. And I know Jack will love to have a little boy cousin, too! 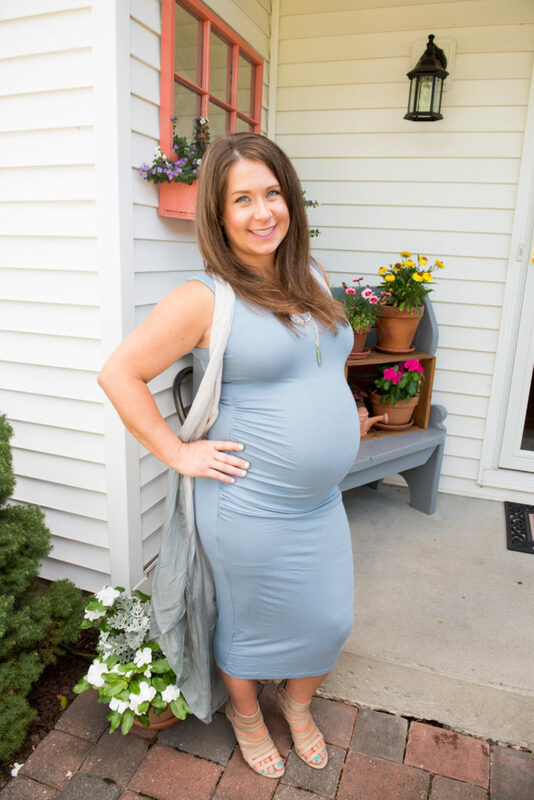 All images were taken by my twin sister, Jess, at Jess Lombardi Photography or my older sister, Amy Syversen. My Mom and I used our Silhouette machines to create a custom decor for the shower. I designed all of the paper products myself in Photoshop. 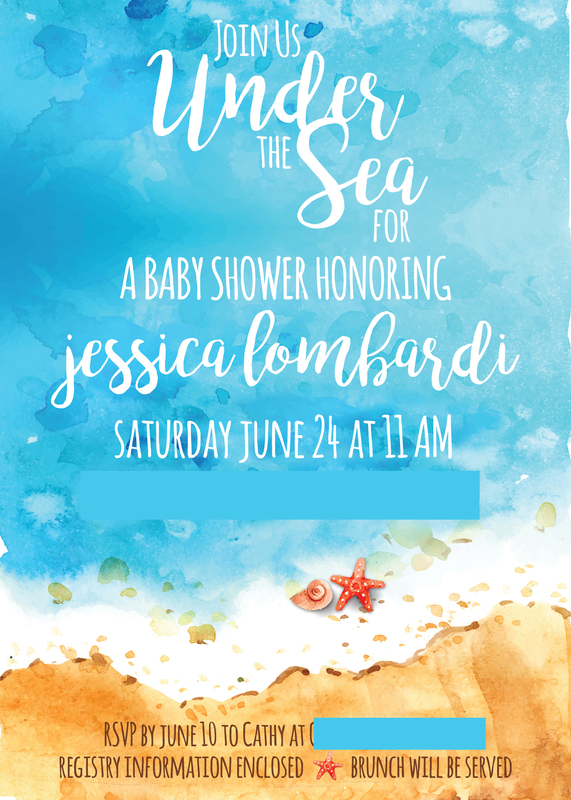 (The background for the invite was designed by Freepik.com and the shell was designed by Freepik.com as well). 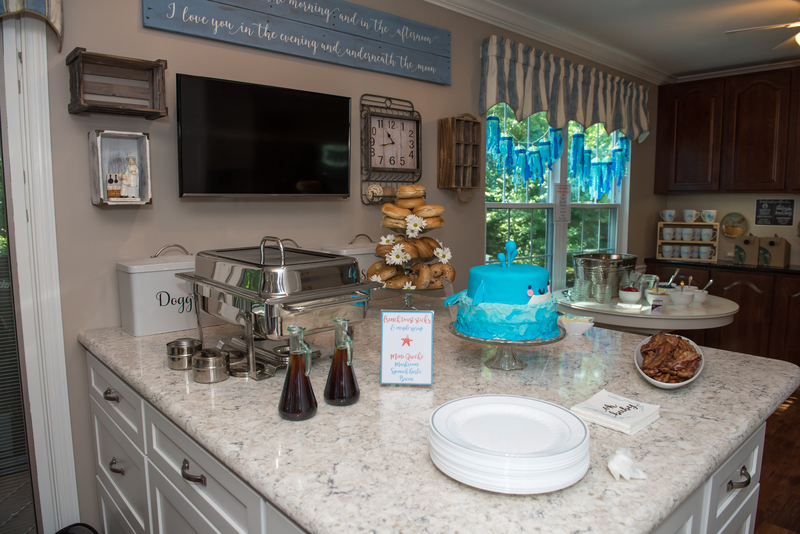 I know that it may come as a shock to you, but when I help throw a party/throw a party, everything has to be coordinated. 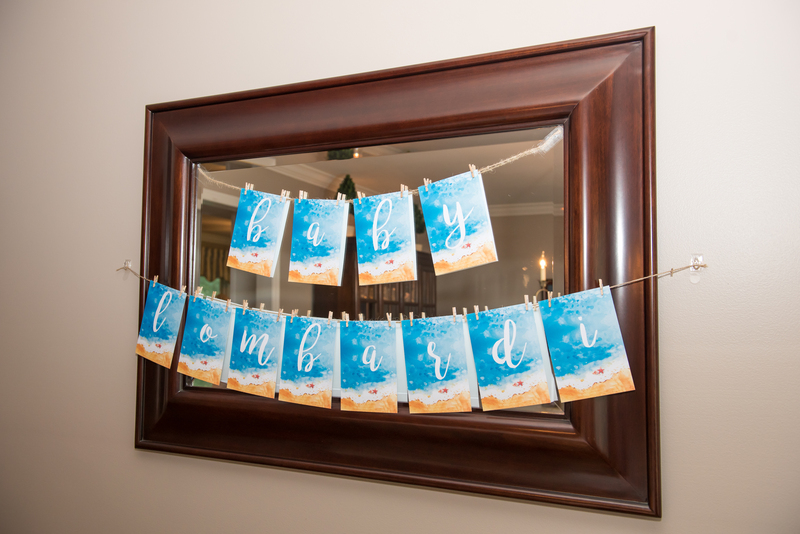 I make sure that the colors, fonts, images, and style of the party all coordinates together. Thankfully, my Mom is the same way and totally gets my insane need for things to coordinate. Instead of cards, we chose to have the guests bring a book with an inscription for baby Lombardi. 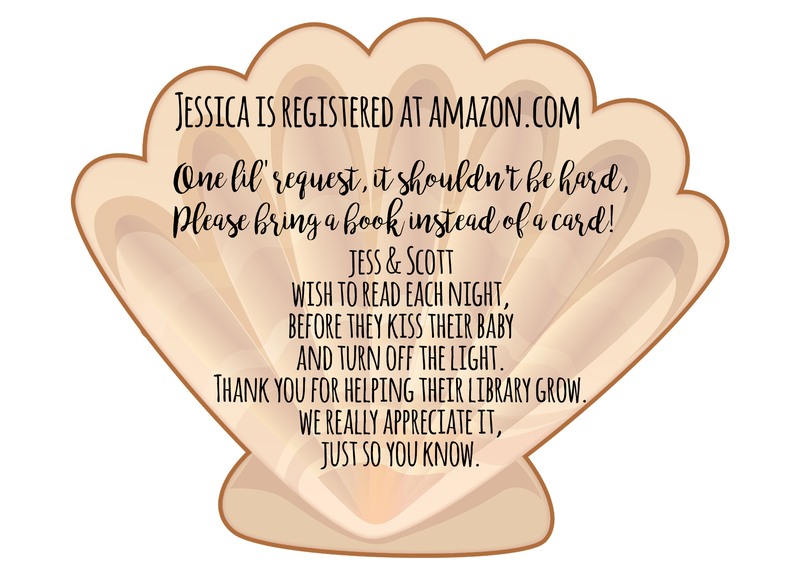 It was a huge hit – the guest loved giving books and Jess, Scott, and the baby will truly enjoy the books for years to come. 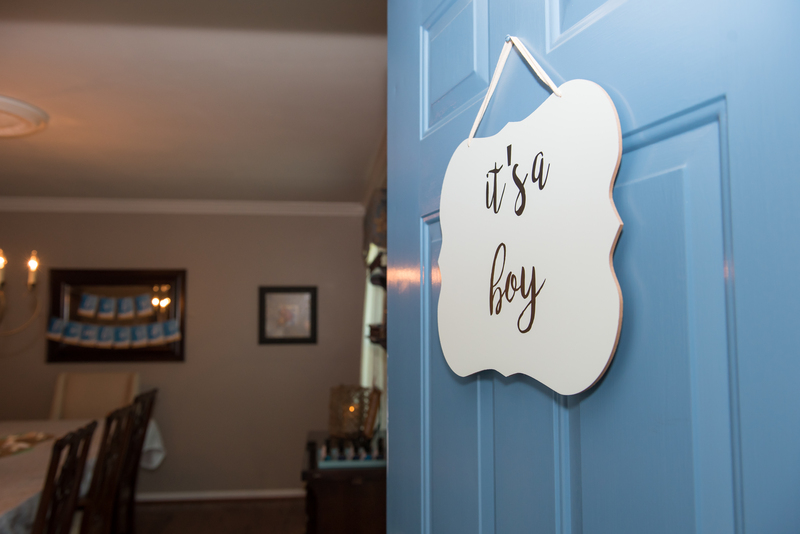 This simple sign was created with removable vinyl and a $3 sign from the Dollar Spot at Target. We used removable so that we could use it again for another function or as decor in the nursery with his name or a quote. This is the first of two wooden signs I created for Jess. I use the same method that I used for my farmhouse, Let’s Stay Home sign. 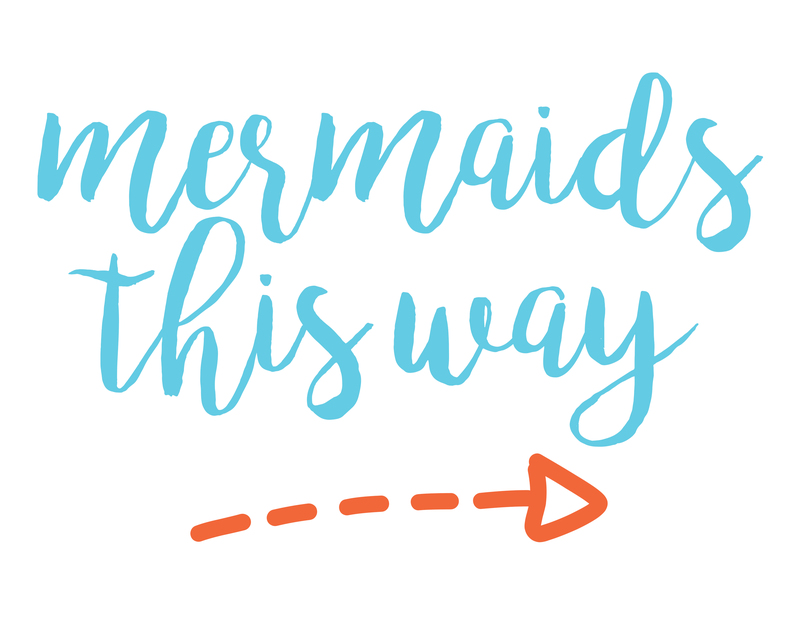 Click here to get the free SVG files for the sign here. 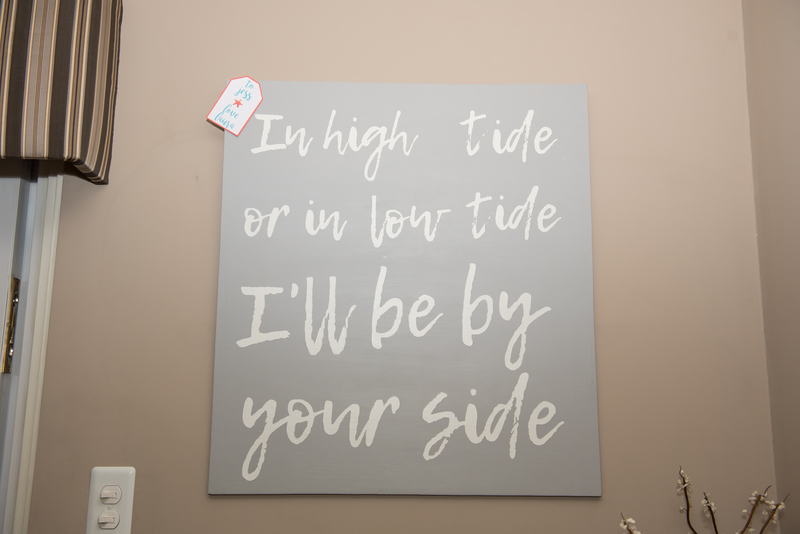 This is the second, much larger sign that I made for the shower and Jess’ nursery (pictured above. We framed it afterwards). This Bob Marley quote holds a special place in Jess and Scott’s. It was part of Jess’ wedding vows to Scott. 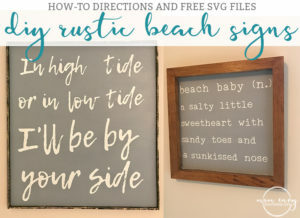 The free file as well as the directions are located here. The cute little french bulldog puppy asleep on the carpet is actually named Marley. Check her out on Instagram. One of the three banners we had up that coordinating with the invitations. We also had a Welcome Banner and a Gifts banner. To make the banner a little more special, my Mom hung the letters using mini clothes pins. 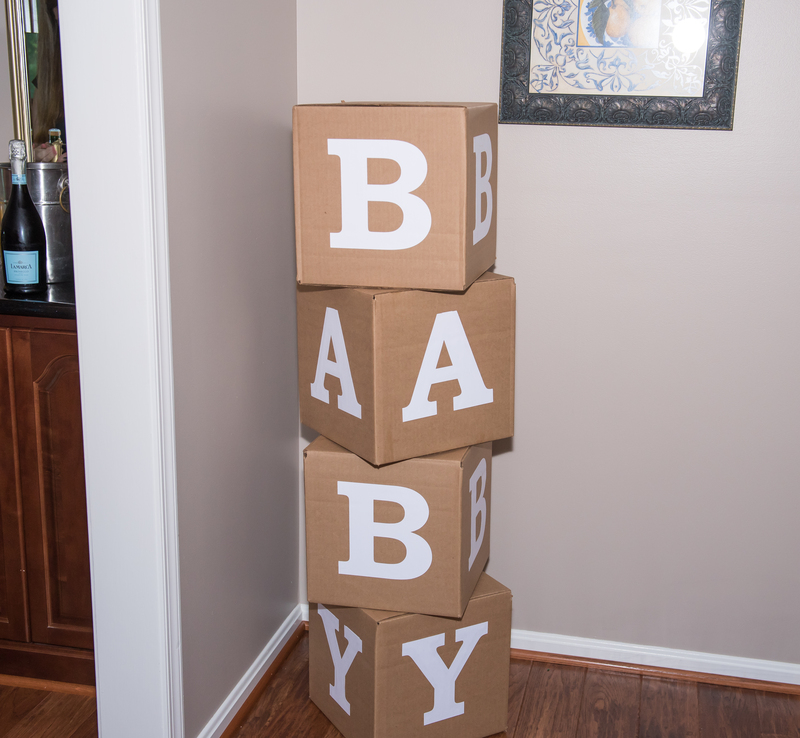 My Mom made these adorable baby blocks out of brown boxes and letters she cut with her Silhouette machine. 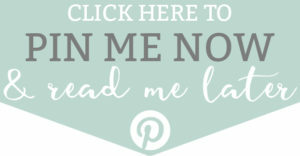 A lot of people do this on Pinterest and fill them with diapers for the parents-to-be. My Mom found these shells at a great price from Marshalls. 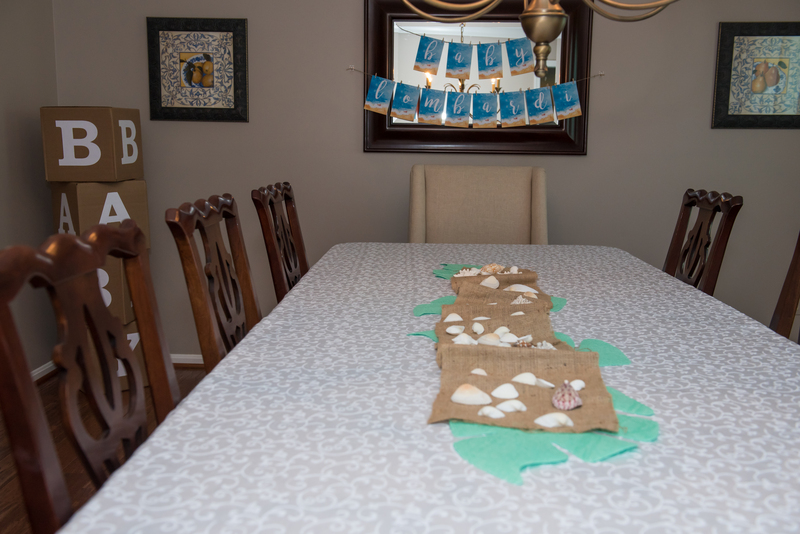 The tropical leaves are from Target’s Dollar Spot, and the burlap is leftover from previous party decor (which was actually leftover from a costume my husband made for himself. He was a big bag of baby spinach from the year with the big spinach e coli scare). Does anybody else keep craft supplies/decorating supplies *just in case* they can use it again? Sometimes I feel like a party decor hoarder. 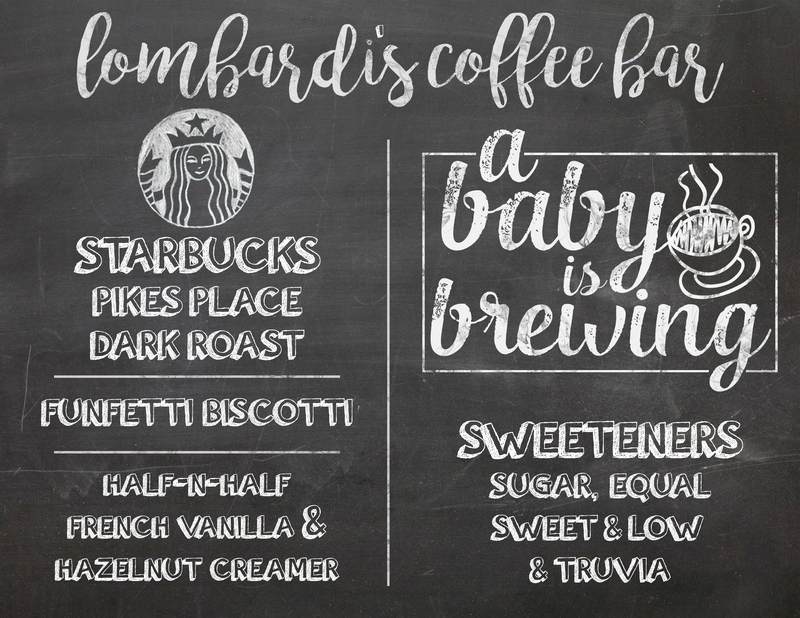 Having a coffee bar was important to my sister, so I created this faux chalk menu. I wish I could write this neatly on a chalkboard! This is the sign we attached to the mailbox. 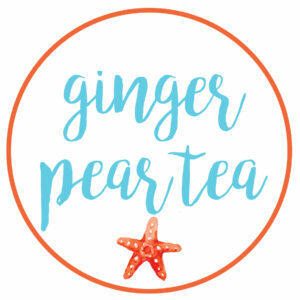 This is one example of the beverage tags we used. We used a version of this tag in multiple places. All of the small signs were created similarly to this yogurt bar sign. 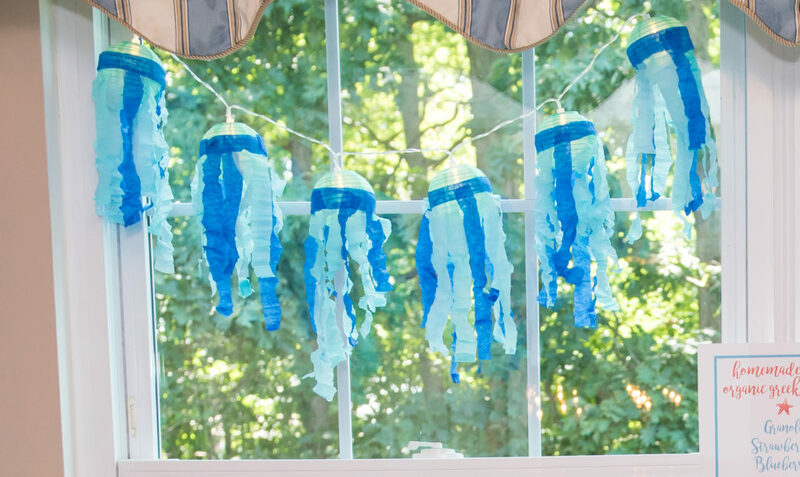 The jellyfish were one of my favorite decor items. They even lit up! 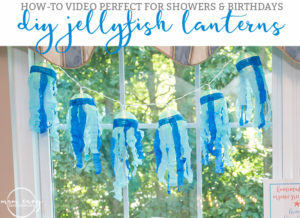 Learn how to make the jellyfish here. My oldest was sad when they had to leave for the party – he wanted to keep them for himself. 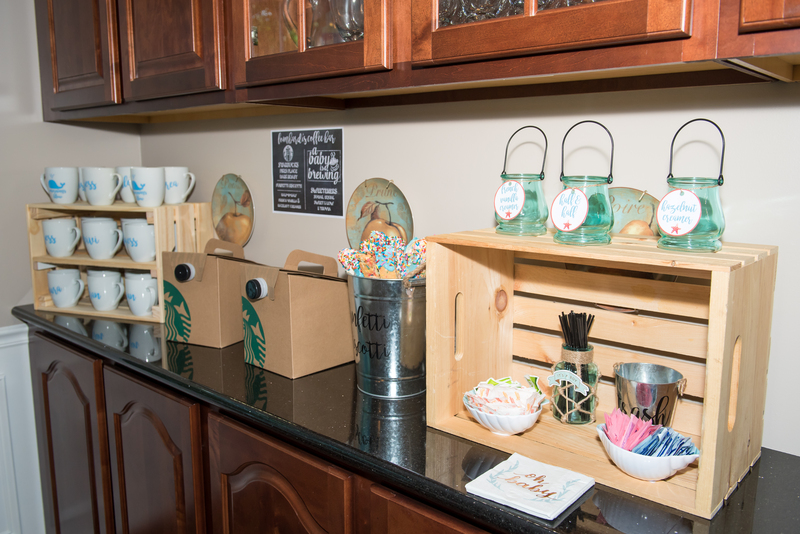 Who doesn’t love a good coffee bar? 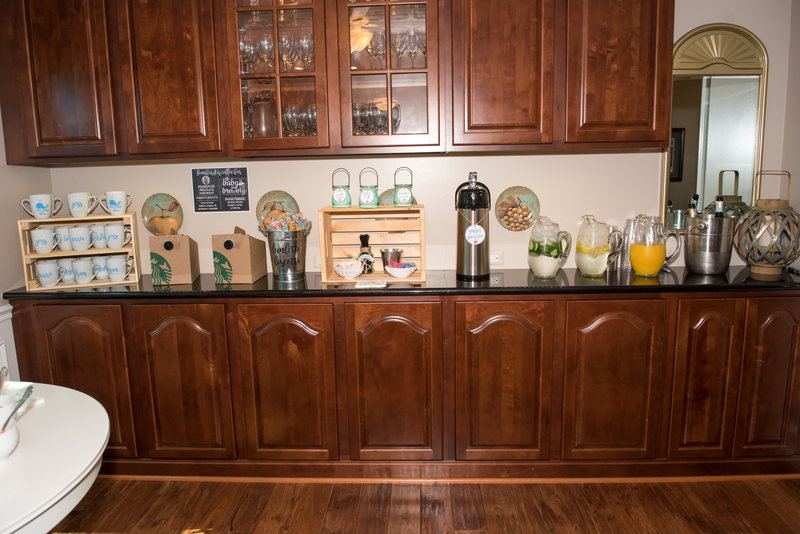 This set-up was beverage central for the party. We served water with cucumber, water with lemon, two different types of coffee, orange juice, and champagne to add to the orange juice into a mimosa. We used removable vinyl to add words to the mini-trash bucket and funfetti bucket. 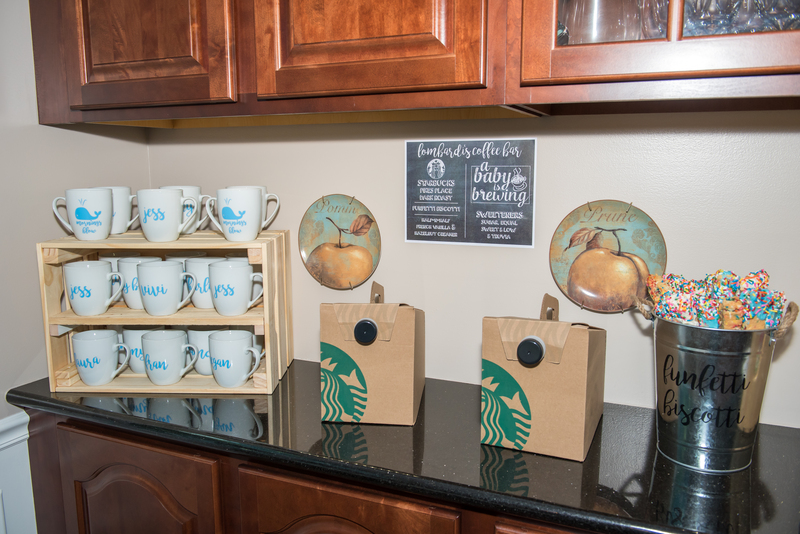 My Dad created the crate to stack the mugs. I will be sharing his DIY soon on my blog. My sister loves funfetti. 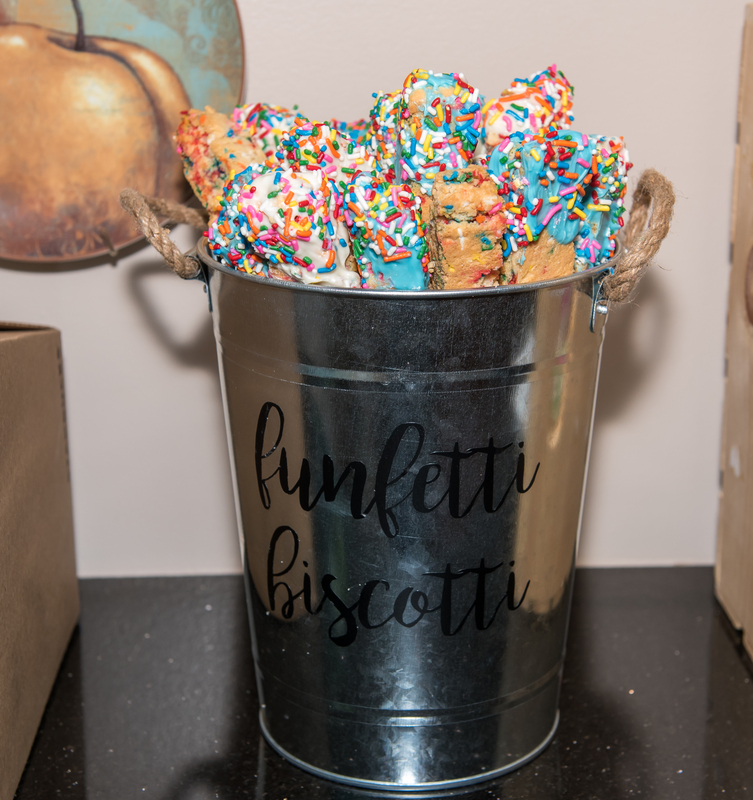 To add a special touch to the coffee bar, we decided to make funfetti biscotti. You can find the recipe here. It was delicious and oh so easy. My sister requested french toast sticks for a shower. 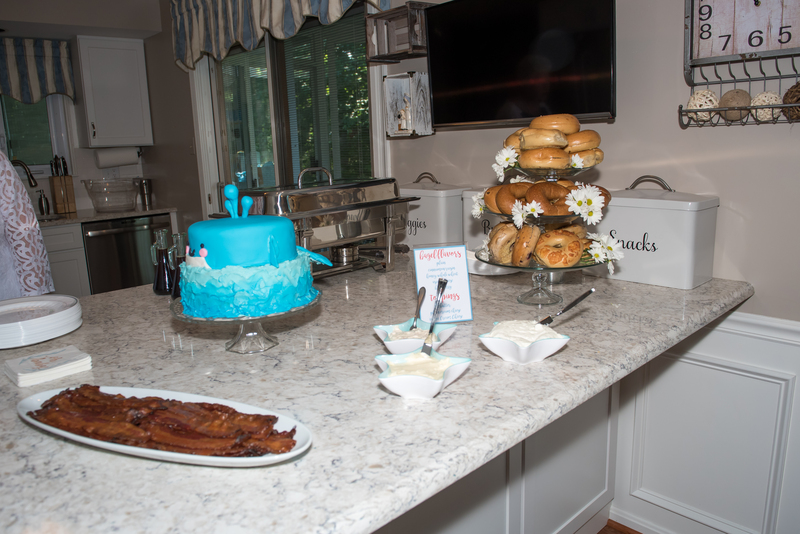 The last thing you want to do at a shower is not give the mom-to-be what she wants to eat. Instead of trying to make them ourselves, we opted for frozen ones. They were a hit (I think they were our most popular item). My Mom candied some bacon and it was a huge hit. Who doesn’t love bacon? If you’re going to throw a breakfast or brunch, make your life easy. Get bagels. 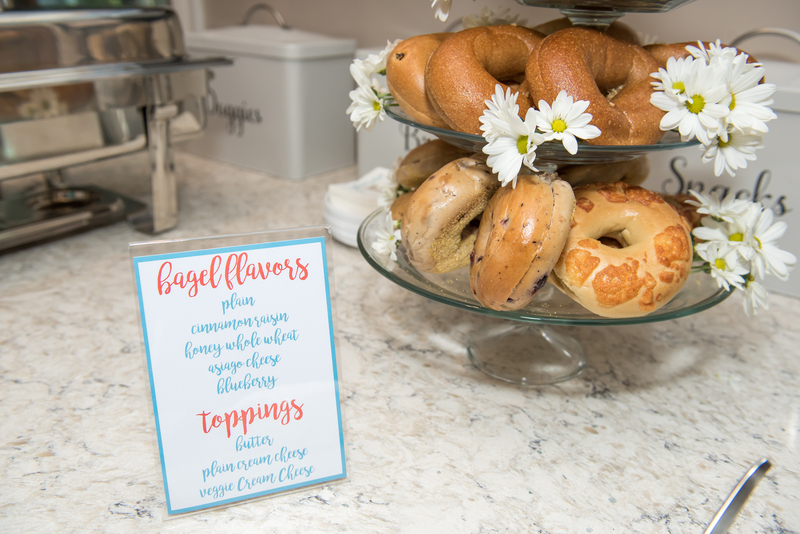 People always enjoy bagels and it saved us so much prep time. 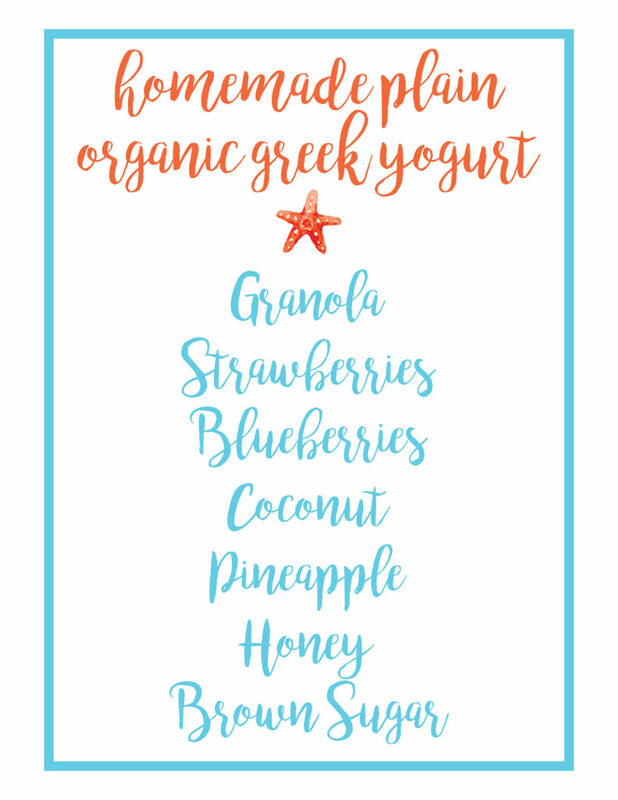 My parents made organic greek yogurt in their Instatpot for the party. It was such an easy choice for entertaining. They made the yogurt beforehand and cut up and prepared all of the fruit (including putting it all in their serving dishes). This took such a load off of the menu. We used a wine bucket Jess and Scott received as a wedding gift from Scott’s Mom to keep the yogurt cool. 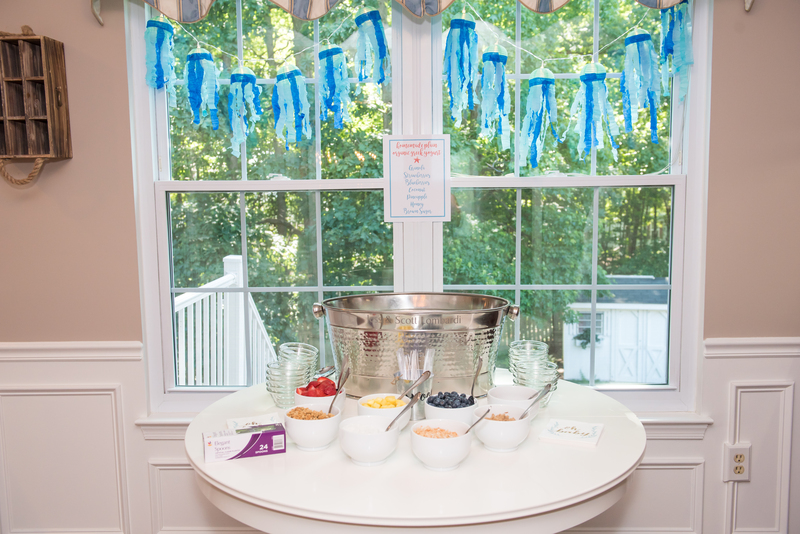 We simply filled the bucket with ice and then placed a glass bowl of yogurt into the ice. My sister created a secret Pinterest board for ideas for her shower. 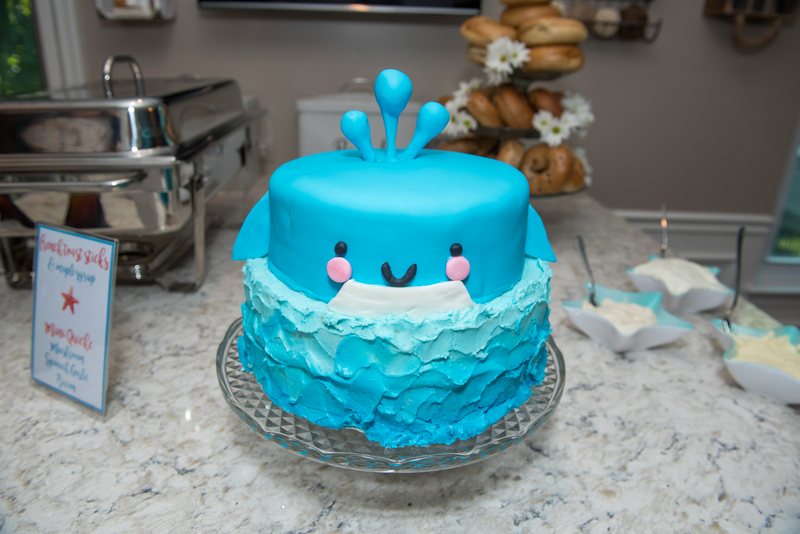 One of the items she pinned a few times were whale cakes similar to this one. I made him using funfetti cake mix (her favorite), homemade buttercream frosting, and Wilton’s fondant. It was actually a lot easier than I thought it would be. I used the end of my icing tips to make the pink circles for his cheeks and one of my smaller circular icing tips for his eyes. I cut the white for his body, fins, and tail out myself. I molded the water coming out of his spout as well and used wooden kabob sticks as support for them (I cut them down). I also used the wooden kabob sticks to support his heavy tail. The bottom of the cake was super easy. I started with a small amount of my dark turquoise icing. I piped a single line around the base of the cake. Then, I added a little bit of white icing and made the icing slightly lighter. I piped another line around the cake. Then I repeated the process until the cake was covered in a gradient of blue lines. Next, I took my off-set spatula and gently smeared the lines into each other in a gentle up and down wavy style to create a wave effect. We had the guests decorate wooden baby blocks. That way Baby Lombadi would have a special toy to play with when he was big enough. You can find them here on Amazon. 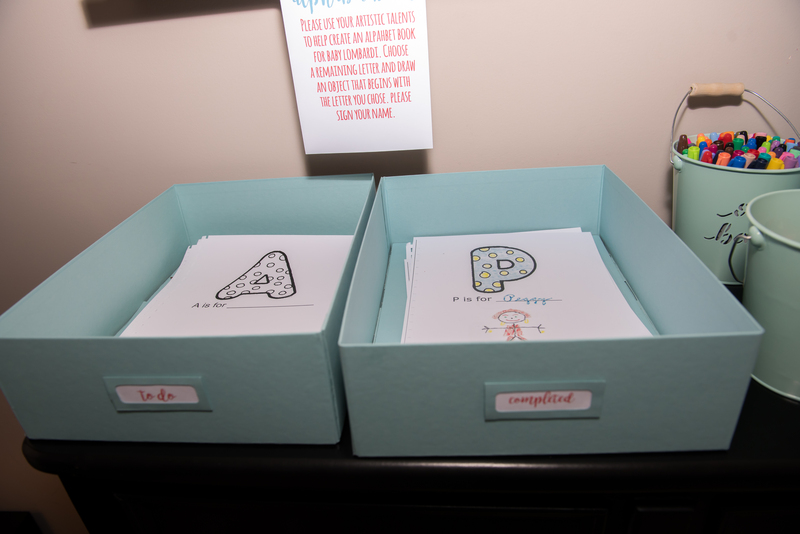 Next, my sister made an alphabet book for my baby shower. It is still one of my most treasured gifts I received at my shower. Carl reads it all of the time. Guest decorated a letter and drew a picture. We printed it again for my twin. We even scanned the letters of two loved ones that have since passed away so that my sister could have the ones they made in the book for her son as well. She found the letters on Supercoloring.com. 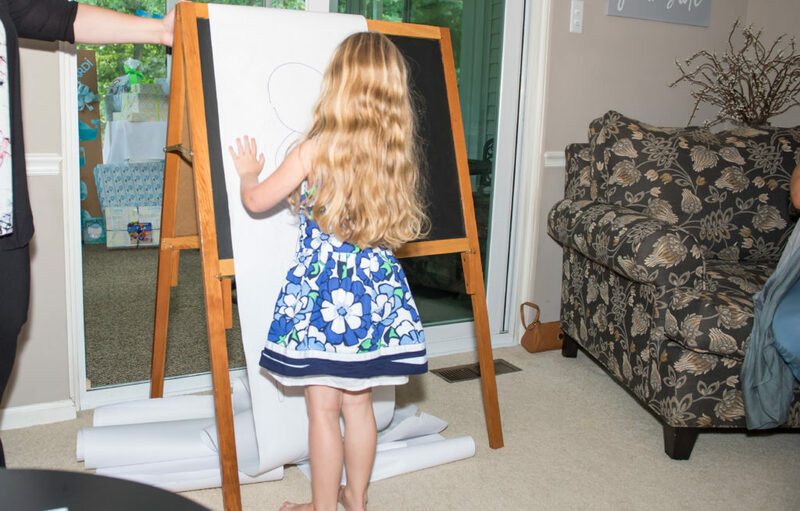 The only game we played was baby Pictionary. The mom-to-be requested that we play a group game that got people involved with each other. We split the room into two groups. We gave each group a set number of clues and a set amount of time. The group had four minutes to get as many answers right as possible. One person would draw one clue and then pass the marker off to the next person. If the groups tied, they would do a draw-off. Each person would be given a clue and the group that guessed it the quickest would win. 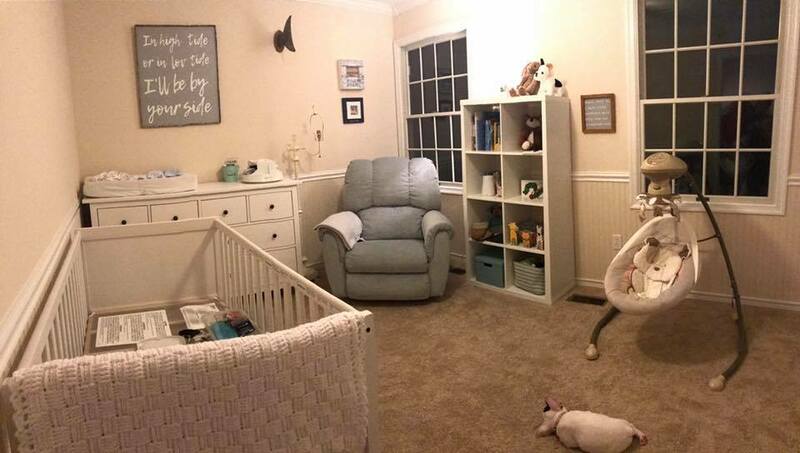 The pictures above are of my niece taking her turn (the clue was baby). 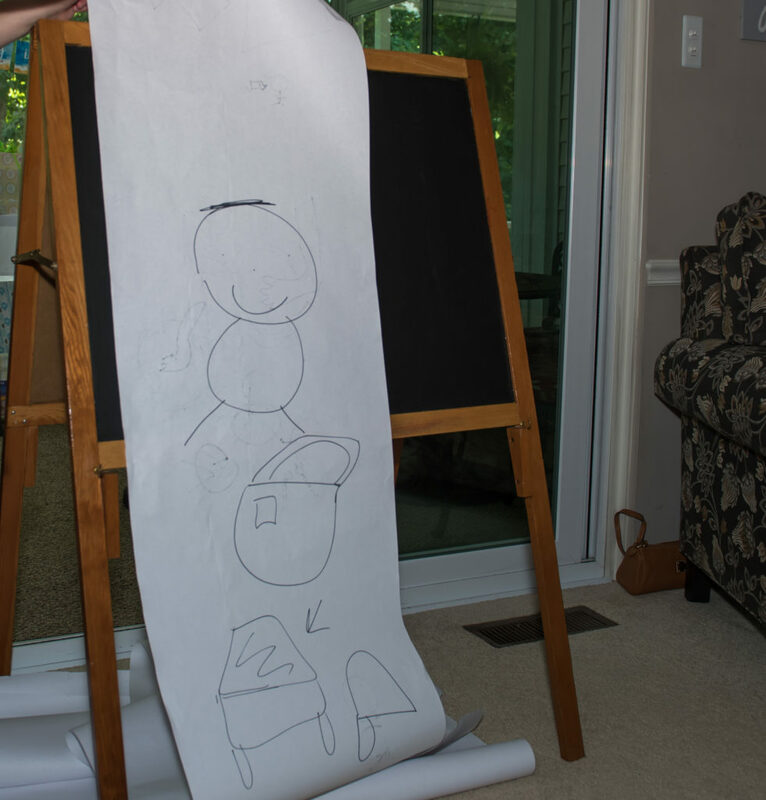 The teams had a mix of simple words such as bottle and some words that we knew would result in funny drawings (such as breast pump). We downloaded the words from Little Things Favors. We didn’t use the entire list, but instead chose to weed through and select our favorite words. We made two favors for our guests. 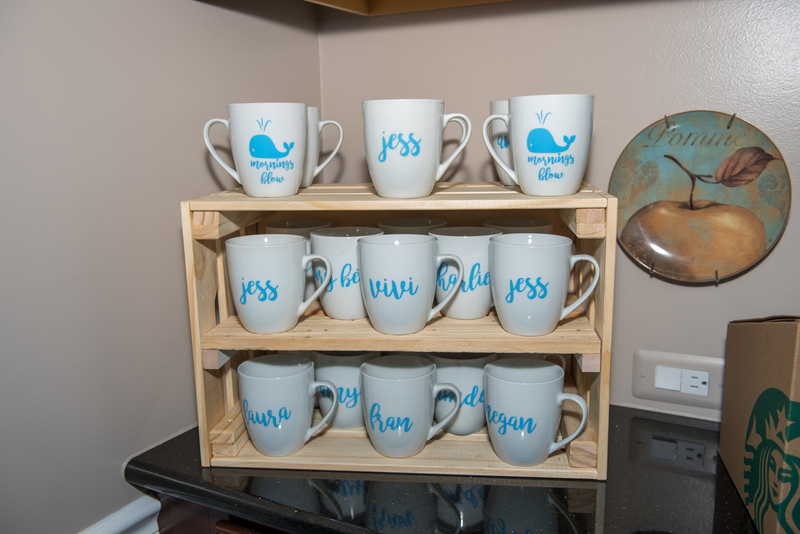 The first one was a custom mug for each guest with a whale and “mornings blow” and their name on the other side. The second item we created as so easy. We bought a set of nail polish in different shades of blue. 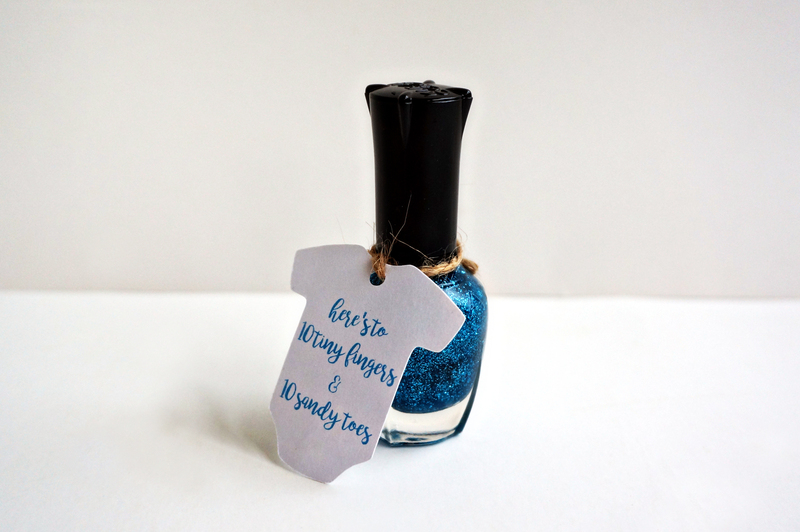 Then, we added a little onesie tag that we cut out using the Silhouette. If you’d like to print your own, I will share the file tomorrow. And that’s it! We had a few other little details here and there (bathroom signs, baskets full of the prize for the winning team (bottles of wine) and runner up team (mini liquor bottles). My sister is a wine/liquor sales rep so we thought it would be appropriate to give away wine and liquor. Plus, we’ve found in past showers that it’s always a hit. 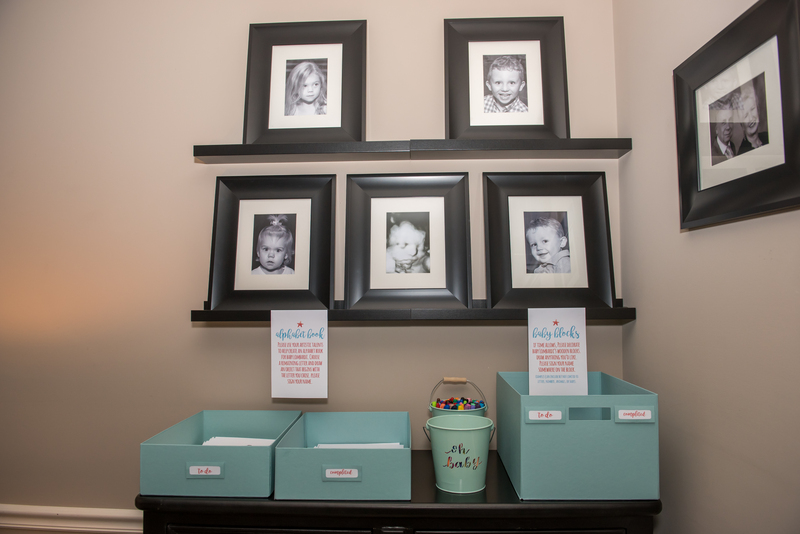 This is the cutest baby shower! And that cake…you’re so talented! Thanks SO much Michelle! I really appreciate your kind words!